If you’re tired of staying in and watching Netflix, sweep your significant other off their feet with one of these Gettysburg dates! These experiences are the ones that will bring you closer, and will create memories that you’ll be talking about for years to come. Taking a scenic hike through the beautiful wooded trails at Strawberry Hill Nature Preserve will add an element of excitement to your relationship. Discover the wildlife in Adams County and enjoy the view! Pull your loved one in close as you walk through the streets of haunted Gettysburg. Learn about the spirits that linger here after the war, and keep an eye out for the unexplainable. We have a number of ghost tours and paranormal experiences to keep you on your toes! Whether you want to dine at a historic restaurant, taste a new meal or sample some of Gettysburg’s favorite dishes with a food tour, we promise that you won’t leave hungry! Enjoy a romantic dinner in our historic town. Ghosts aren’t the only spirits in Gettysburg. Explore our local wines, ciders and spirits together for a true taste of Adams County! When the sun is out and the weather is warm, pack a picnic and enjoy the company of your partner while taking in the stunning views at our wineries. We have a wonderful selection of spas to help you unwind. De-stress as a couple and forget about the obligations of everyday life. You’ll both leave refreshed, rejuvenated and relaxed! What better way to bond, than to try something new together! You can explore the battlefield by Segway, by scooter, by bicycle or even on horseback. You’ll both be laughing hysterically as you figure out how to balance on a Segway, or how to keep your horse from wandering off the trail to munch on some grass! The Majestic Theater in Gettysburg is known to bring in big name comedians and entertainers. We also have several local theaters worthy of a standing ovation. Plan your next date night around a performance that meets your fancy! Picture this. You take a scenic drive through the rolling hills and bountiful orchards of Adams County to one of our farm markets. At the farm market, you stroll through the farmland hand-in-hand picking juicy apples, cherries and strawberries. After your buckets are full, you take them home to make a delicious pie or tart together. Now, that’s romantic! 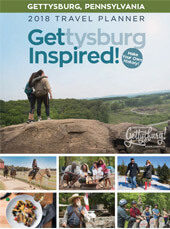 We hope these ideas have inspired you to turn off Netflix and plan a date night in Gettysburg! If more than one catches your eye, stay in Gettysburg for a couple of days and plan a romantic getaway with your special someone.